India is experiencing a significant boost in over-weight (obese) cases, like every other country in the world. As being obese is an alarming situation for everyone as it’s the root cause of dozens of medical problems and it can worsen the health issues for people who are already suffering from some small looking health problems. In order to control the weight, before it turns out life-threatening, Indians as other country citizens, are choosing a surgical procedure for weight loss which is known as Weight loss surgery or Bariatric surgery or Obesity surgery. The number of patients coming to India for weight loss or Bariatric surgery is increasing every year. The high-tech medical facilities and use of emerging healthcare technologies have helped in successful Bariatric or weight loss surgeries in India. Our hospitals in India also use exact similar technologies and tools/machines used in other developing or even developed countries. But still, the cost of Bariatric or Weight Loss Surgery Cost in India is quite low. We’ve got very experienced bariatric and weight loss surgeons and world-class quality medical treatment standards and on top of it, the affordable cost has helped India gain better results by achieving higher success rates in Bariatric or Weight Loss Surgeries in India. This is the most commonly preferred bariatric or weight loss surgery in India. As per the medical records, It has been practiced for over 30 years. This surgery has a very high long-term success rate as compared to other type of weight loss surgeries and with the relatively low rate of mortality and post-operative health complications. the patients who undergo this usually lose about 20-35 KGs of their initial excess weight and this significantly reduces or cure most of the life-threatening medical conditions related to severe clinical weight issues. The cost in India: Roux-en-Y gastric bypass surgery cost in India is around ₹ 5 Lakh (₹ 5,00,000/-). 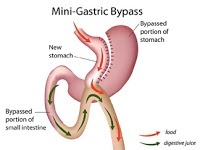 The mini gastric bypass technique of weight loss surgery is relatively simple, low-risk and quick weight loss procedure. As per the records, the results of this type of procedure have been good with long-term weight loss. The cost in India: The mini gastric bypass technique of Bariatric or weight loss surgery cost in India is around ₹ 4.75 Lakh (₹ 4,75,000/-). 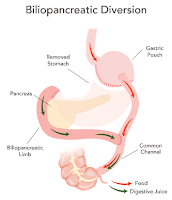 In Biliopancreatic diversion technique, the portions of the stomach are removed. It is a malabsorption surgery which reduces both the food intake capacity and the number of calories and nutrients absorbed by the body of the patient. The cost in India: The Biliopancreatic diversion technique of Bariatric or weight loss surgery cost in India is around ₹ 4.5 Lakh (₹ 4,50,000/-). 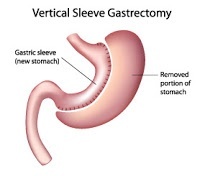 The sleeve gastrectomy is a technique in which the stomach is reduced by 15% to even 70% of its original size by removing a large portion of it following the major curve. The open edges are attached together to form a sleeve or a tube with a banana shape. This procedure permanently reduces the size of the stomach. This procedure is performed on extremely obese healthy patients who have a BMI of 40 or more. This procedure is performed laparoscopically. The cost in India: The sleeve gastrectomy technique of Bariatric or weight loss surgery cost in India is around ₹ 4.25 to ₹4.75 Lakh rupees. Click here to contact us and we’ll assist you in getting the best surgeon within your budget.